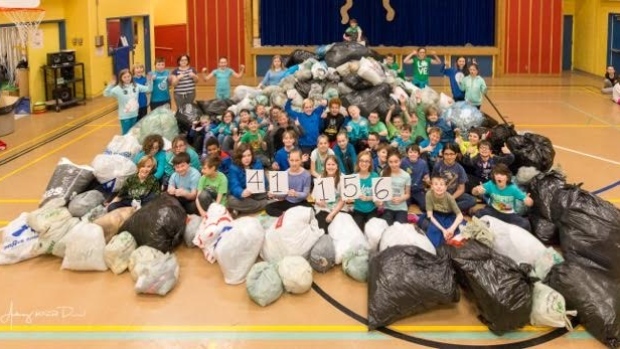 As a part of Walmart's national campaign to collect and recycle plastic shopping bags, our school responded by collecting an astounding 41156 bags in only 4 days! Check out our story! Our school far exceeded our expectations during our Plastic Bag Grab sponsored by Walmart. In one week, we collected over 41 000 plastic shopping bags! We would like to thank you all for your enthusiastic participation. On the same note, we also encourage you to pause a moment to consider that in one short week, our small school community was able to collect over 41 000 plastic shopping bags. We would like to extend the challenge to all who emptied their stash of plastic bags to commit to using only reusable shopping bags. People tend to justify the use of plastic bags by recycling them. Consider for a moment the three Rs - Reduce, Reuse, Recycle. They are intended to be practised in that order. Reduce first, then reuse, and recycle as a final effort. Did you know that there is now a fourth R? It’s Refuse. The Environmental Committee at Beachy Cove Elementary is hoping you will consider to refuse using plastic bags as a part of your daily and weekly routines. You actively responded to our challenge to collect plastic bags. Can you now take action against collecting that many plastic bags again? ​Feel free to read more about the fourth R at https://ecocanary.wordpress.com/2010/10/07/the-forth-r-refuse/.